I, Willy Wonky, have decided to allow three children, to visit my Research facility this year. These lucky three will be allowed to see all the secrets and the magic of my facility. Then at the end of the tour, as a special present, one of them will be given enough chocolates and sweets to last him/her for the rest of the life! So watch out for the Choc Tickets! The Chocolate room. An important room, this! This is the heart of the whole research facility. And so beautiful yes! Below the melting chocolate wall, are bars and bars of chocolate, 100 different flavours! There, it’s all chocolate! The inventing room. All the most secret new inventions are cooking and simmering in here. The connoisseur, exotic, double fruit series are some of the ones which will make your saliva-gland start working. Not to mention there’s the classic, nut, coffee and tea series. Only Brad Brat left. The winner, with enough chocolate & sweets to last him for the lifetime! 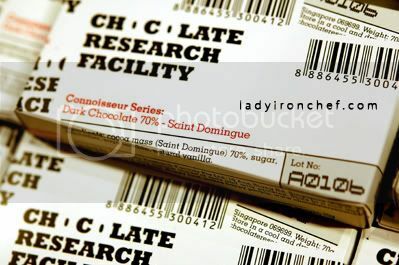 The dark chocolate 70% from Saint domingue in the spotlight. 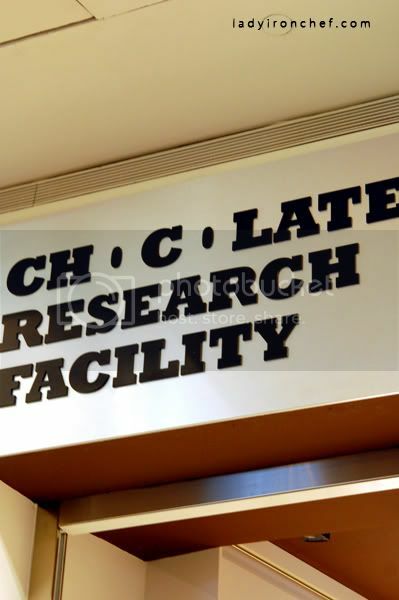 Chocolate Research Facility (CRF) is a chocolate boutique, which comprises of a retail store and a cafe. The interesting layout of the shop, the unique packaging of the chocolate bars, the intriguing combination of flavours available, meant that you need to grab a bar here! The chocolate are priced at $8, 10, & 12 for different flavours. I brought one bar, guess the flavour! This post is inspired base on the story, Charlie & the chocolate factory by Roald Dahl. I have made some changes to parts of it, no intention of misusing the author’s right. ooo.. did you get the spiced tea chocolate? that one is the bomb. haha. Sihan: haha yay first to comment. lol! spiced tea choc? Not so adventurous. haha. how many u tried liao? i want to go!!!!! i need chocolates!!! but why the chocs are displayed on a table, like books? i’ve tried 6 flavours and all didnt exactly leave an impression. the lychee martini was supposed to be one of their best sellers, for me it was so so (coz can’t taste the lychee nor the martini). oh and my fave part of the store, it’s the small cubes of numbers on the window display.. next time i’d try the stuff at the cafe though. Evan: hahahaha yeah so that people can see them easier? 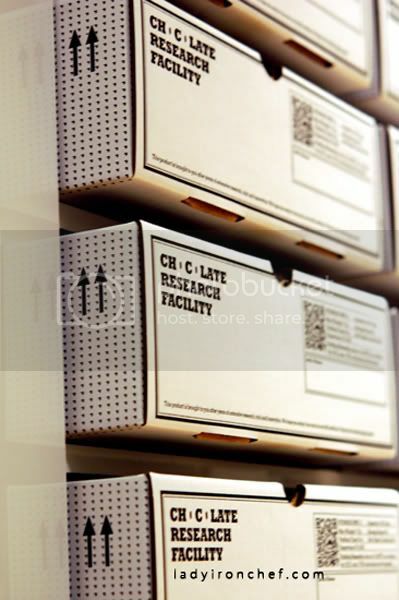 the rest are all in shoe-box alike on the wall though. sinny bug spread to everybody. lol! yeh.. the storage area is really odd. haha. boxes and straight lines everywhere. nothing like what chocolate reallie is. But then again, I’ve only tried two. The earl grey and the spiced tea. the latter was a clear winner. But then again.. if only they mixed dark chocolate with earl grey. that would have been phenomenal. Perhaps I’ll try more next time. and definitely no lychee martini for me. Thanks laffabug. sihan, i tot u never been there b4? dark choc with earl grey? sounds like a fantastic idea, i shall incorporate these two into my future bakes haha. then again choc seem to go well with EVERYTHING – banana, orange, raspberries, green tea! lauffabug: lol! yeah sometimes we are too concentrated on what is in front, that we never look around us. evan: she been there already! that time hear her mention before. haha. yeah please use them into your future bakes so that we can taste and benefit from it. lol! I’ve tried dark choc and earl grey before in my cupcakes. Worked like magic.. provided that subtle smoky flavor to the entire makeup of the ganache. Lovely. tts why you should try it! hehe. Anyway. the place is cool. but the chocolate ain’t reallie of substance.. and not to mention i find the plastic wrapper inside damm irritating. haha. Hi Sihan, no probs! if you like black sasame, it’s one of the better ones i have tasted. it’s with white choc though. Hi Evan, have you tried cheese and chocs in your bake too? They had this bar which had shredded bits of Parmesan in the chocs. hmm.. i think if they were more generous with their cheese bits, it might have been a winner for me. i saw your latest creation.. salivating already!! Any food trip coming up? i’m interested too! can count a newbie in? ah…what a chocoholic i am! lingzie: hahaha actually i wanted to write the golden tickets, but changed it to choc tickets instead. yeah come come, i can bring you around! hows the price? ive seen it on tv,and thought that it was cool.